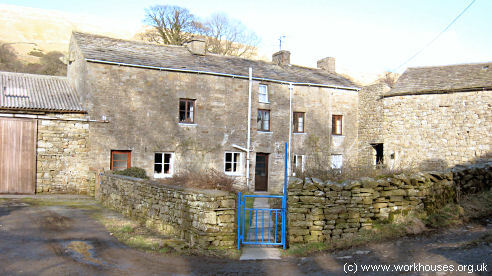 Sedbergh's first workhouse opened in 1732 at Settlebeck, thought to be located in the property now known as Settlebeck Cottages. After a few years, the workhouse moved to a house on Main Street opposite the foot of New Street. A parliamentary report of 1777 recorded that the workhouse at "Sedberg" could house up to 30 inmates. In 1789, the Sedbergh Churchwardens and Overseers made an elaborate agreement with two Howgill men for "letting", or farming, the town's poor at an annual fee of £195. 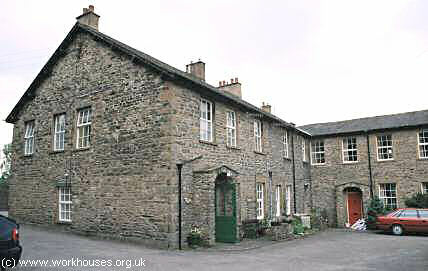 In 1834, the report of the Royal Commission on the poor laws noted that the Sedbergh workhouse had 19 inmates: five men, four women, seven boys and three girls. Of the women, two were old and two middle-aged, one of whom had been taken in 'to be confined of a child by another man than her husband'. Of the men, three were middle-aged (one able-bodied, one a cripple, and one idiotic) and two were old. The idiot was occupied in stone-breaking with a lad helping him and earned 6d. per cart load (about half a ton) for the broken stones. Two of the boys were employed in the cotton mills and earned 3s. a week of which they were allowed to keep 3d. out of each shilling, part of which they spent on 'procuring better clothes for a Sunday's dress'. The girls helped with the domestic work and were taught sewing and knitting. The inmates received four meals a days, with meat dinners four days a week, and milk-porridge bread and cheese and on other days. For other meals the ate water-porridge with milk and bread —'as much as they can eat'. The old people had tea or coffee for breakfast and drinking. Industrious inmates were allowed an ounce of tobacco a week. Children under nine were sent to a dame's school. Dent had a workhouse from 1733 in premises at Hall Bank to the north-east of Dent, now part of a farm. Former Dent workhouse site from the west, 2008. Former Dent workhouse site from the south-west, 2008. Sedbergh Poor Law Union officially came into being on 11th January 1840. It was the smallest union in the West Riding of Yorkshire, comprising only three parishes: Sedbergh, Garsdale and Dent. Sedbergh and Garsdale were each represented by six Guardians, and Garsdale by two. The total population falling within the union at the 1831 census had been 4,711. Initially, the union continued using the old workhouses at Sedbergh which could house 55 inmates, and at Hall Bank to the north-east of Dent which held 45. 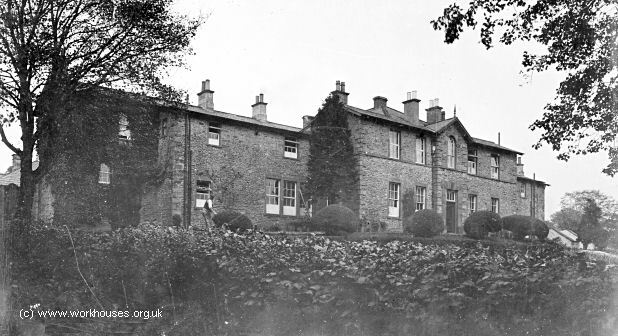 In 1842, the workhouse in Sedbergh had 27 inmates including several families (four young women, each with one or two young children, and an older woman with three children) four old people including a couple in their late seventies. The master and matron at this date were Thomas Capstick and his wife Jane. By 1851, the number of inmates had fallen to fourteen, including two single mothers each with a baby and an older child. Conditions in the Sedbergh workhouse were far from satisfactory, however, and were regularly criticised by the Assistant Poor Law Commissioner for the area, Mr Hawley. On one occasion it was reported that part of the building had been let to a carrier for the storage of gunpowder immediately beneath the sleeping rooms of some of the inmates (Scobie, 1996). Sedbergh main block from the south, c.1905. The workhouse comprised a T-shaped main building facing to the south, and a porter's lodge and casual ward block fronting onto the main road at the west. Sedbergh main block from the south, 2001. Sedbergh rear of main block from the north-west, 2001. Sedbergh porter's lodge and casual-ward block from the west, 2001. In 1861, a parliamentary survey of all workhouse inmates who had been resident for five years or more revealed that Sedbergh workhouse had two such residents: Ann Cowper (20 years) and John Cragg (15 years), the reason in both cases being given as "imbecility". The beds and bedding are clean and comfortable. The diet, clothing, medical attendance, and nursing are satisfactory. There is no chaplain. The inmates of all denominations have the privilege of attending their own places of worship twice on Sunday. The children attend the National School in Sedbergh, and are not numerous. In 1930, control of the establishment passed to the West Riding County Council. A council architect's report on the buildings found that they were "not in good repair, and are very unsuited for their purpose." The accommodation then provided was for up to 65 inmates, including 20 male and 7 female "casuals" or vagrants. Lighting throughout the building was by gas. The kitchen was fitted with a coal fire range and a gas cooker, and the laundry equipment was described as "primitive". Washing facilities for the inmates consisted of a long stone sink with only cold water laid on. A single bath served for the whole of the main block. Even the master's quarters had little to recommend them — he had no private bathroom or w.c. and his living and sitting faced out onto the internal courtyard. The casual block operated on the association system had a separate communal dormitories for males and females, fitted with platform beds. After 1930, the site was used for a vriety of purposes including a book store and prisoner-of-war accommodation. It was bought with the idea of turning it into a country hotel and for a while Roman Catholic Sunday services were held there. In 1976, the buildings were converted to residential use. Kendal Archive Centre, Kendal County Offices, Kendal LA9 4RQ. Very limited holdings include: Minutes (1894-98). Scobie, Joyce (1996) Sedbergh and District Workhouse in Yorkshire History Magazine, 1, 6, pp.5-7.